I am one of those girls who loves me some tea... and coffee... and well, lets just say that if it's wet, I'll drink it... so when I was asked to check out some great new Brew Over Ice flavors for the Keurig, I knew that I'd have to share them with you! Calling all Keurig® brewer lovers! Did you know you can make refreshingly cool iced beverages with your Keurig® brewer? Whether you’re craving an iced coffee, or a home-brewed iced tea, you can enjoy delicious beverages from the comfort of your own home with Brew Over Ice K-Cup® packs! With our variety of mouth-watering flavors, you will have no problem creating the perfect beverage to revital-ice your day. Simply fill a tumbler with ice, choose the brew that best suits your taste buds, hit the 6 or 8 oz button on your Keurig® brewer, and get ready to enjoy the sweet sensation of Brew Over Ice! What I loved about the Sweet and Creamy Iced Coffee was that it was perfectly balanced and all in one.. I really prefer my iced coffee with that sweet and creamy flavor and texture as it gets and this K-Cup meant that I didn't have to fiddle with my coffee at all - it brewed perfectly over ice and had just the right balance of sugar, cream and wonderful iced coffee flavor! With the Snapple Peach Iced Tea, I was honestly expecting to find chunks of peach floating in my tea! I didn't get to have more than a sip of this one before Erik stole it and drank it down... he's a tea fanatic and I fear that he'll be learning how to work the Keurig before long to be able to make his own Brew Over Iced Tea! Finally, there was something new to me in the box, Strawberry Pomegranate Vitamin Burst - so before I even tasted it, I went online to see what kind of vitamins I'd be brewing for myself! Both Robyn and I are huge fans of pomegranate flavor so when I learned that we could get Vitamin C, Niacin, B6 and B12 all packed into this Brew Over Ice K-Cup, I was definitely intrigued! (See nutritional info to the right) The first taste was amazing - you could definitely taste both strawberry and pomegranate and it was a great consistency and brewed really well over ice. The one thing I did notice was there was a bit of a bitter aftertaste once I'd been sipping it for a bit, but I won't let that stop me from trying it again! Out of all three of the new flavors, I have to say that my favorite was the Sweet and Creamy Iced Coffee, partially because it's the most complicated to make right for me normally. The second would be the Strawberry Pomegranate, which was really refreshing and had all those great vitamins and finally, the tea - only because I really didn't get to drink it... they were all great! 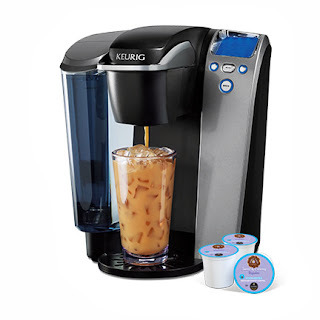 I can definitely see using the Keurig to Brew Over Ice any time I want I fabulously cool pick me up! US residents can enter here to win their own Brew Over Ice Prize Pack - just fill out the rafflecopter form!